Being a member of club may be a very fulfill knowledge in anticipation of the day the work of keep up with your membership data with the help of the club application template. Example of Club application template is very supple for meeting the requirements of health clubs, of every size. It can be put in in an autonomous health club that clubs having branches at numerous places. You can also see Rental Application Template. These samples or formats can provide most of clients in a short period of time. You can modify its features, which suits your needs. It is appropriate for yoga centers, fitness clubs and confidential clubs. Apply with the help of club Application Samples. 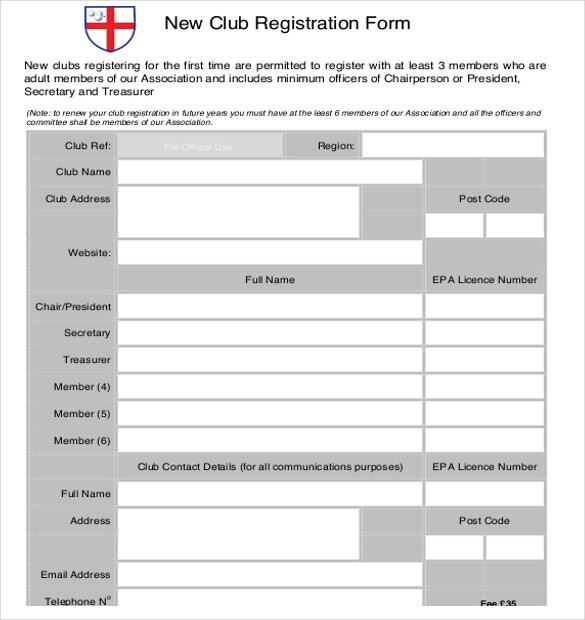 This template consists of a sample club membership application form. 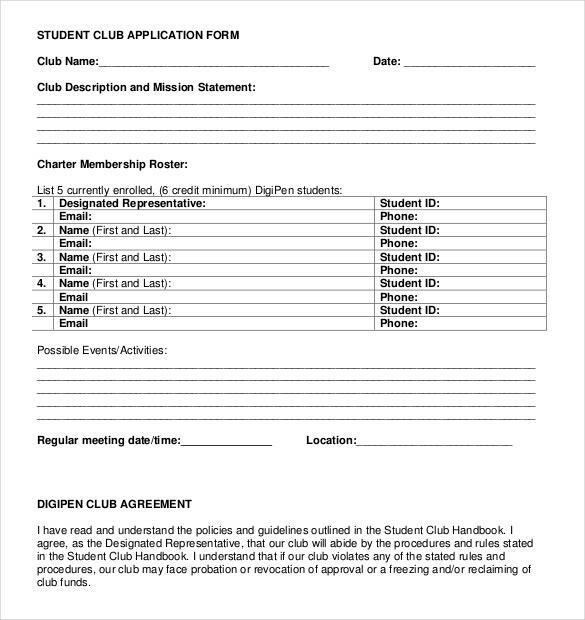 The clubs can use this form for the students who want to apply for their membership. You can download this template and print it for your use. You can also use this template as an idea and create your own forms. You may also see Free Application Templates. 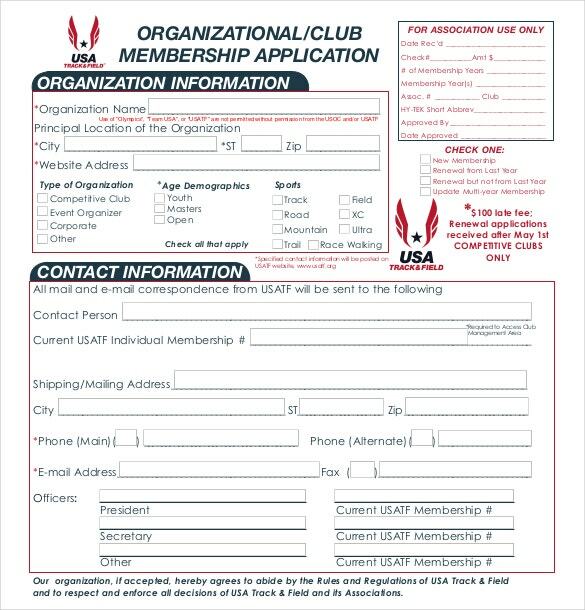 Every club has a membership form for people interested in being a member of their club. 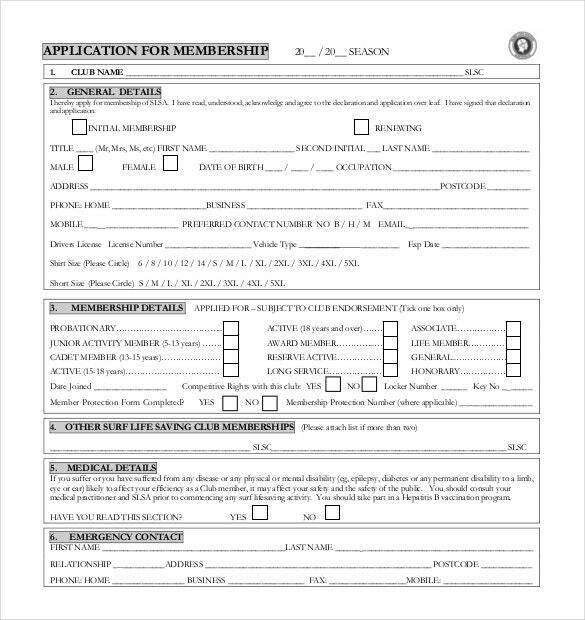 There are many kinds of club membership forms. This template can also be used by a club which requires few personal details of the applicant. You can download and print this template for your use. You may also check out Application Templates in Word. This template consists of a free sample gold club membership application form. You can use the same form or make some changes and customize it according to your requirement. 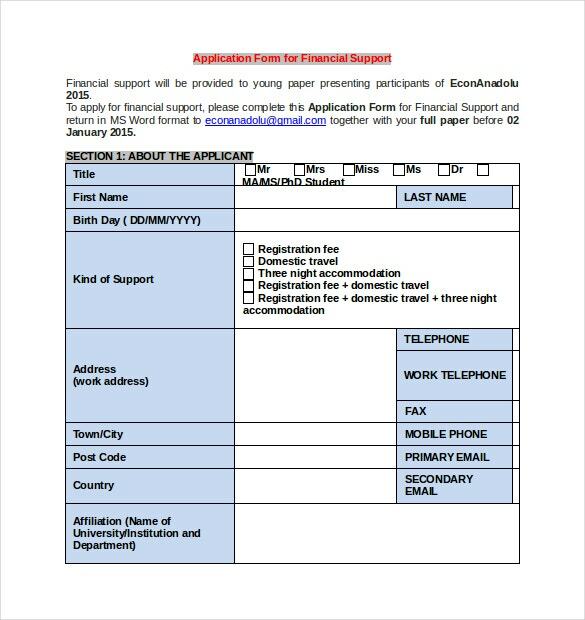 This form requires the personal details of the applicant and two references. You may also see Downlodable Application Templates. Need membership forms for your golf club? This template is perfect for you. It consists of a club member application form sample of a golf club. 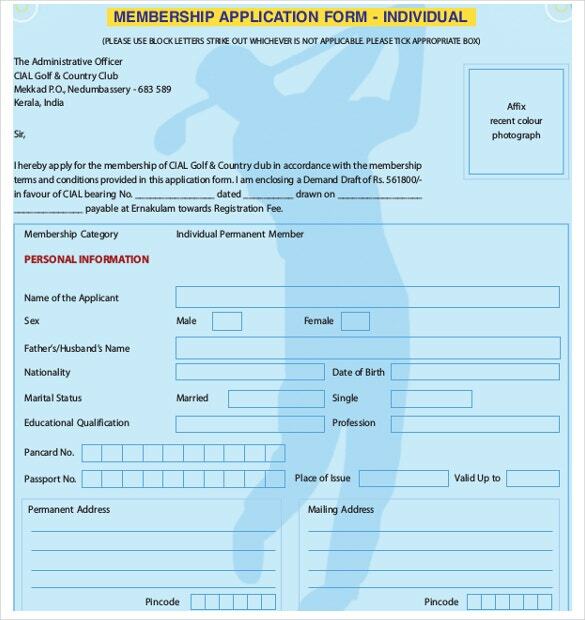 This template also has a background image of a person playing golf which will give your forms a personal touch. You may also see Sample Application Template. These templates are used by schools for inviting applications different clubs that may include sports club, poetry club, hobby club, music and arts club and many more. The templates can be used by students for applying for membership of the different clubs in the school. You may also see Work Application Templates. These templates can be used by colleges for accepting applications for memberships to the different clubs. These clubs may be based on the type of subjects, activities or hobbies. The templates can be used by various social clubs to organize and maintain data of their members. These clubs may be associated with social activities. You may also see Mentor Application Templates. Health clubs may use customized application templates to maintain data about their members. The data may relate to various aspects like their age, weight, ailments and medical conditions. This organized data can help the club to organize activities on the basis of the requirements of the members. These templates are commonly used by clubs which are formed on the basis of the profession of the members. The clubs can be based on various professions like teaching, medicine, law and management. The club application template helps to maintain the data of the candidates in an organized manner. The template should capture all relevant information about the candidate. However, it is important to ensure that the candidate is not over burdened with the requirement for unnecessary information. Considering this, the key points which may be included in the template are: You may also see Printable Job Application Templates. Type of membership offered by the club. Club membership requirements such as educational qualifications, designation and other credentials. Conditions of membership including the activities to be performed by club members. The membership fee of the club if applicable. The reasons for the applicant’s interest in joining the club. 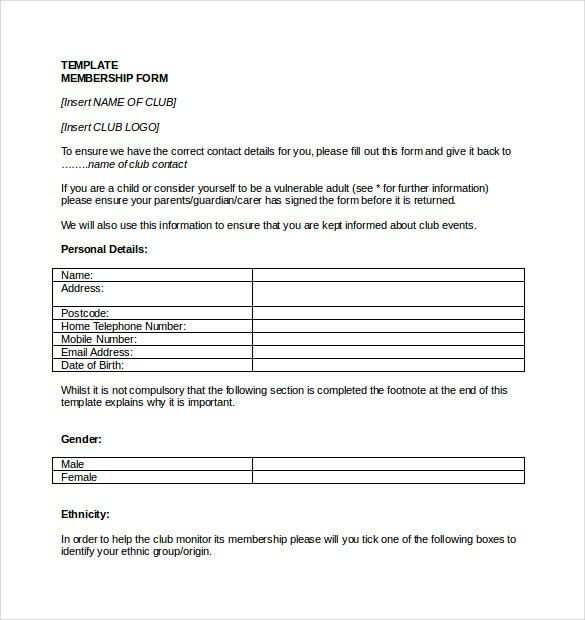 Club application form templates can be used by various clubs for taking personal details of all the membership applicants. Designing your own membership form from scratch is a task in itself. You can download these templates for your use. You can also edit these templates, make the required changes and customize it according to your requirement. You can also use these templates to get an idea regarding various types of club membership forms and design your own. 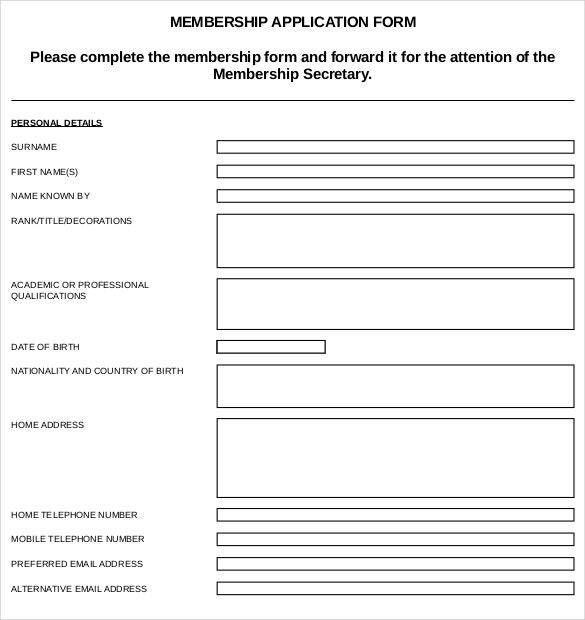 These membership forms are important to keep a written record of all their members for safety and security purpose. You may also check out here Application Examples. 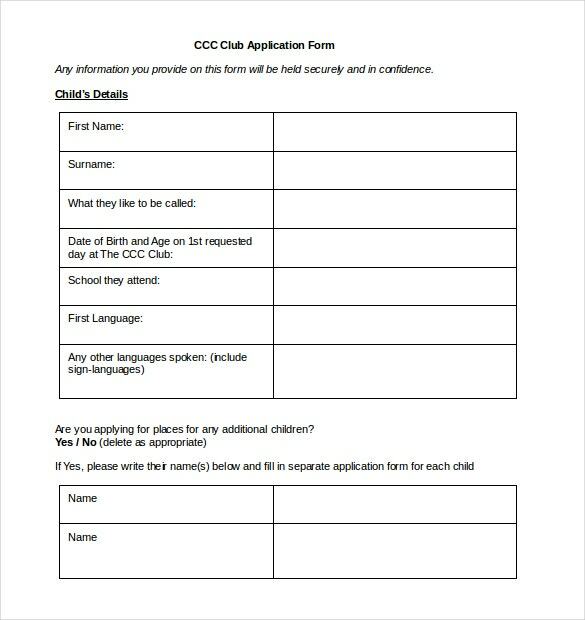 These club application form templates can be used by the clubs for anyone who wants to be a member of their club. 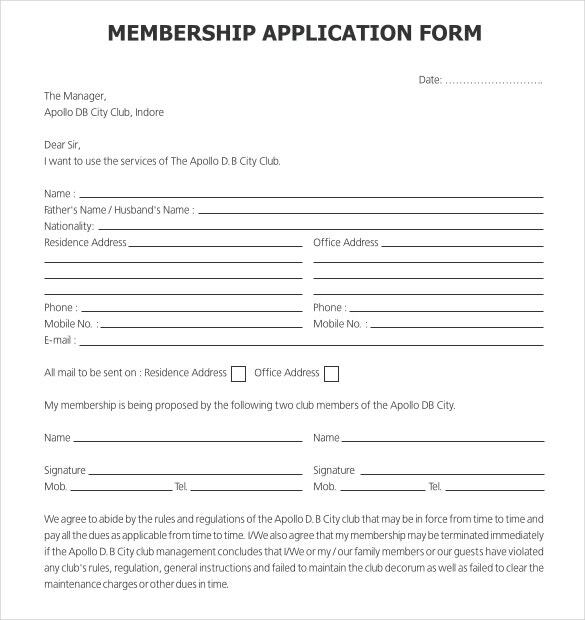 These are club membership forms where the personal information details of the applicant are taken. And then the club decides the applicants who get the membership depending on their personal information. These templates can be downloaded by the clubs and printed for their use. 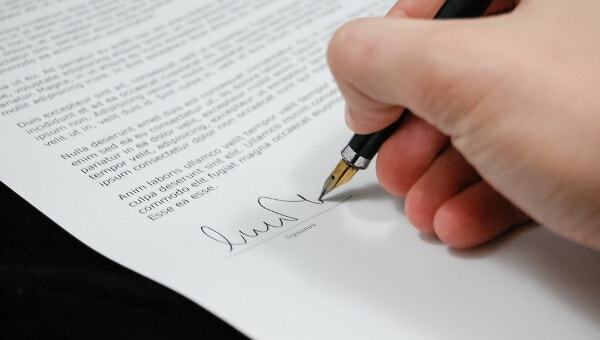 They can also use these templates to get an idea regarding the details required and then design their own personalised and customised club membership forms for the applicants. You may also see Employment Application Templates. The club membership application forms are filled up by those interested in getting a membership for that particular club. The forms require you to give your personal information and in some forms, a reference is also needed. 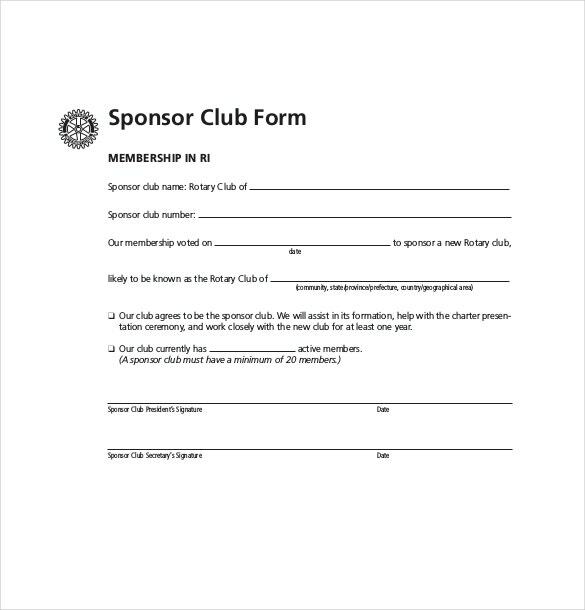 These forms help the clubs in having a written record of all their club members. This also helps them in finding out the authenticity of a particular applicant. If a member misbehaves or steals something or destroys the property, the club can take proper measures and contact the concerned authority with the individual’s personal details so that he can be tracked easily. 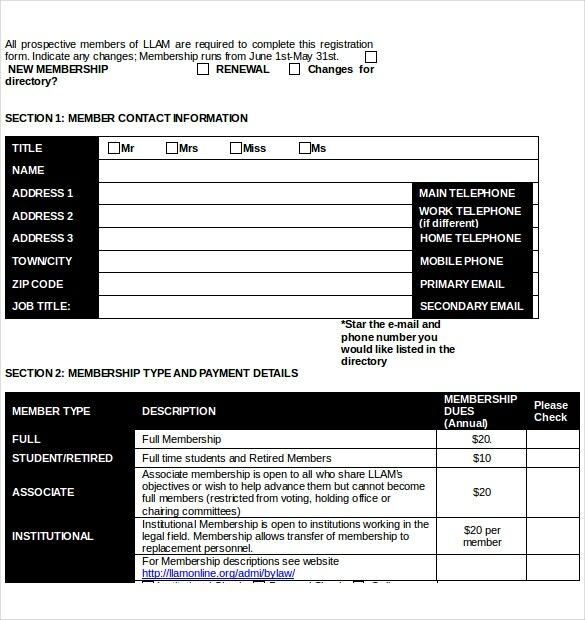 You may also see Membership Application Template. 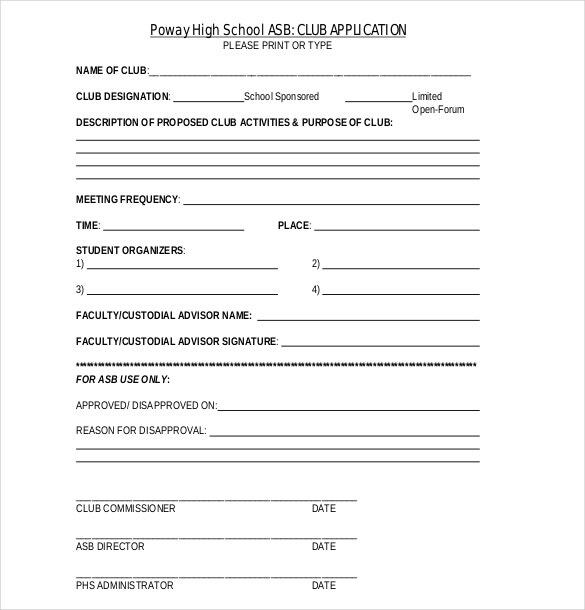 These templates include different kinds of club application forms. You can download these templates for your use and print it. 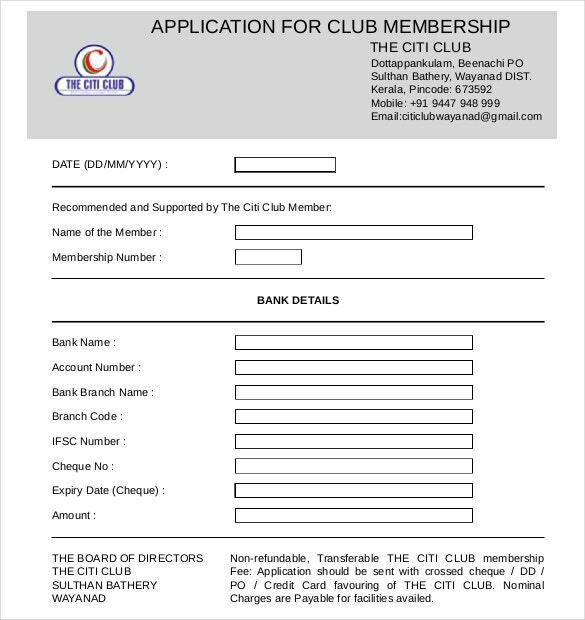 You can also use these templates to get an idea regarding the different kinds of club membership application forms and the details required. You can also modify the features as required.